It seems worse to break a promise to the dead than it does to break one made to the living. Why else would I be standing by the gates of my old school waiting for a bunch of strangers I used to call friends. This book turned me into an emotional wreck! It sent out feelers into my heart from page one and I couldn't put it down. Non encapsulates the fear and worry connected with revealing something personal to the people in your life perfectly. There is always the possibility that you will be rejected when you reveal a secret, which often leads to us keeping our secrets to ourselves. Non shows that it's OK to be honest and true to ourselves. This book also deals with a time in teenager's life where everything is about to change. They are on the verge of adulthood and sometimes you have to look backwards in order to move forwards. 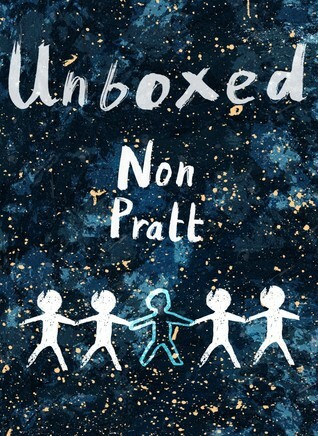 Unboxed really felt like an emotional coming of age book. The characters are quickly brought to life, making you invest all your feelings into them. I loved Alix! She is such a beautiful soul. And I hope we get to meet her again someday. This may be a short book, but it is jam packed with emotional highs and lows. It's like The Breakfast Club but with way more feels! When I finished it, I wanted to read it all over again and then break into song, singing Don't You Forget About Me by Simple Minds and fist pump the air!!! The more books I read published by Barrington Stoke, the more delighted I become. So much thought goes into producing them to make them dyslexic friendly and the ideal book for a reluctant reader. If you know a teen who isn't keen on reading, buy this book. If you love good stories which tap into every emotion you have, then buy this book too!